The following obituary was taken from the Beckley Post Herald, front page, dated Febuary 13, 1933. Funeral services for E. P Beasley, Chesapeake and Ohio railroad station agent at Glade, who was killed when hit by a train at Glade Saturday morning, will be held at Meadow Creek this afternoon at two o'clock. Mr. Beasley met instant death, when with Rev. David Richmond, he alighted at Glade from a west bound train shortly after six o'clock Saturday morning and was struck by passenger train number four running east. His companion, Rev. Richmond escaped unhurt. It is thought the agent failed to hear the approach of the train which killed him. 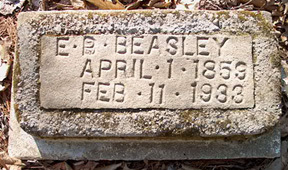 He was the father of H. M. Beasley of Beckley, and had been accustomed to traveling daily by train from his home at Meadow Creek to the station at Glade, where he had been agent for a number of years. He was a cousin of former Deputy U. S. Marshall James Beasley. 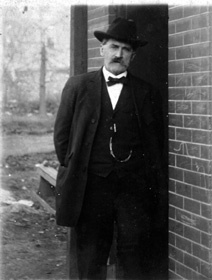 Other surviving relatives are his second wife and several children, residing at Meadow Creek, One of his sons, Charley Beasley, lives at Alderson, and a daughter, Mrs John Richards, resides at Quinnimont.